You don't have to listen to local radio or worry about losing your signal when you're on an off-roading adventure if you're traveling with a Jeep Wrangler satellite radio. This Sirius kit gives you dozens of commercial-free stations that play directly from your Jeep's radio. This Sirius satellite radio installation kit includes an I-sheet, a wiring harness and the Jeep Wrangler satellite radio antenna that's necessary for reception. 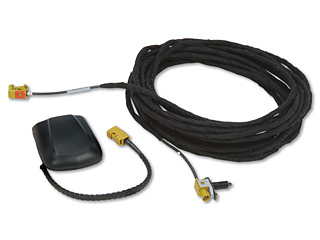 Sirius Satellite Radio Installation Kit, includes I-sheet, wiring harnesses and antenna. Requires radio with integrated satellite built into it. MUST HAVE RES OR REQ RADIO WITH SALES CODE RSC. If your Wrangler is built prior to 11/30/06 you must also order item # 55395602AC along with installation kit. See Accessories tab above. Q: How do I access my 12-digit ESN/SID Number? A: With the ignition switch in the ACCESSORY position and the radio OFF, press the Tape Eject or CD Eject (depending on the radio type) and Time buttons simultaneously for four seconds. The radio will display all twelve (or four of the twelve) digits at one time. If only four digits are displayed press the SEEK UP button to display the next four digits. Continue to press the SEEK UP button until all twelve ESN/SID digits have been displayed. Q: What if I have questions or technical difficulties? Quick shipping and accurate description. The item shipped quickly and arrived as described what do you want a novel?